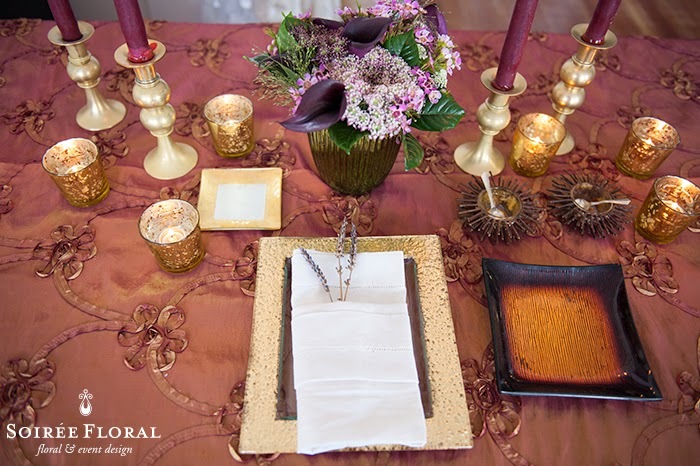 Last week we shared Look One - a table design with goldenrod and pops of green. 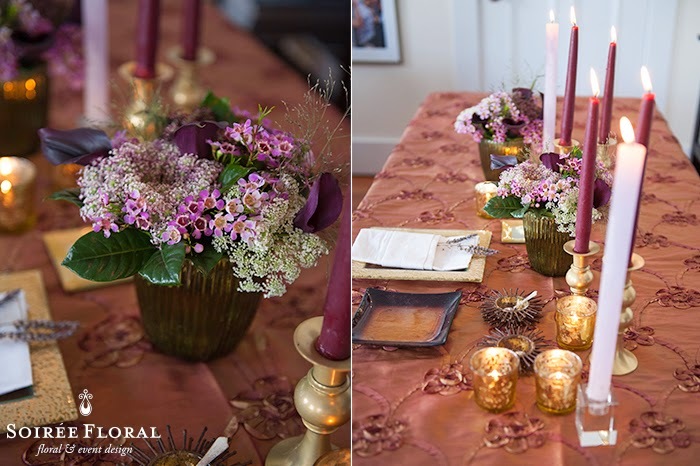 Today we're revealing Look Two of our four part series on Thanksgiving table designs! This look features the same base elements - plates, taper holders and vases paired with different flowers, candles and linens. We wanted to challenge our design brains by keeping some of the same elements throughout each tablescape and just swapping out a few things; in this case color was the main swap! 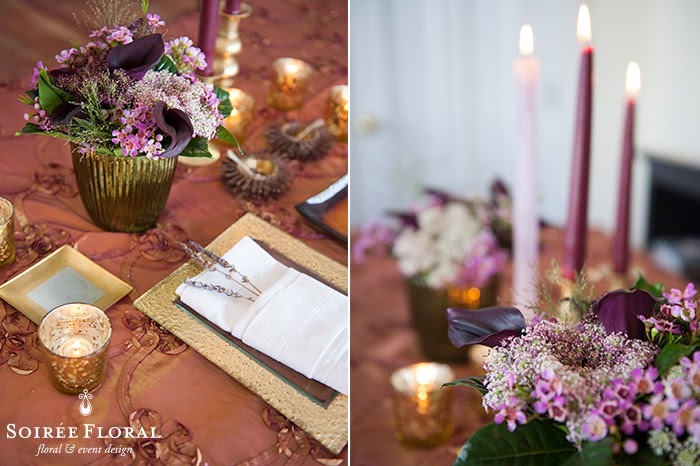 This design in centered around shades of plum and eggplant, brassy-golds, vibrant golds and pops of green. Look One featured two options for a little something at each guest's placesetting and for this look we snuck in a few sprigs of dried lavender - fragrant and thoughtful. 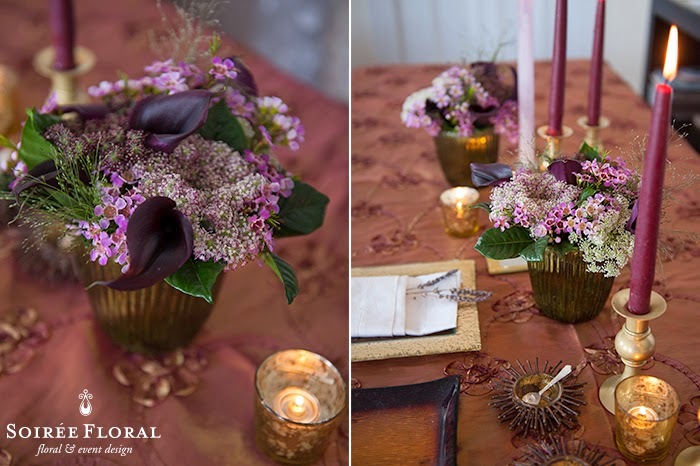 This look evokes a different mood than Look One, it's more "moody" in the way of the table linens and the calla lilies added a formal touch to the whole design. Thank you again, Placesetters for allowing us to play with your inventory. Contact Placesetters for your next wedding or event for tabletop, furniture and linen rentals! Now for the fun part - time to make this look your own! Click through to our Polyvore style board to shop this look.